(NNPA)–Inspirational. Servant Leader. Math Geek. Funny. Detail Oriented. Confidant. Serious. Role Model. Mentor. Female NBA Executive. These are just a few of the many adjectives one could use to describe Dallas Mavericks CEO Cynthia Marshall. Marshall, better known as Cynt Marshall, is all of these, for sure. But to many in the NBA world, MFFL’s and the immediate Dallas/Fort Worth Metroplex she’s much more. She’s arguably the woman who saved the Dallas Mavericks franchise. “She just great. If I had known her sooner, my life would have been a lot easier,” said Mavs owner Mark Cuban. Marshall was hired by Cuban in February of this year following a Feb. 20, 2018 Sports Illustrated article titled, “Exclusive: Inside the Corrosive Workplace Culture of the Dallas Mavericks.” The report described a culture in the Mavericks’ front office “rife with misogyny and predatory sexual behav­ior” and chronicled multiple allegations of sexual harassment and other work­place misconduct by current and former employees on the business side of the Mavericks. Marshall, a former diversity and in­clusion senior executive at AT&T, was brought on board as CEO to oversee the investigation and right the franchise’s ship. Cynthia Marshall and Mark Cuban at her introductory press conference. Since the Mavs scandal, the NBA is looking to hire more women in posi­tions of power. In comes Marshall who is one of a handful of women in positions of power in the traditionally male-dom­inated NBA. 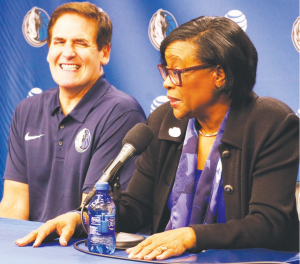 The affable CEO, who on any giv­en day can be found at a local school encouraging young students, holding court in Mavs staff meetings, participat­ing in conference calls and cheering on the team at American Airlines Center, understands her position and knows its importance in history. Marshall recently spent time talking with Texas Metro News about her posi­tion, her hope for the future of women in this industry, what drives her, what ticks her off, her biggest accomplish­ments and failures, and more. TMN: What does this position as CEO mean to you as a woman in a tradi­tionally male-dominated industry, as an African American woman and as a role model and mentor to other women in sports and in management in any pro­fession? MARSHALL: “It’s a blessing in dis­guise – an employee used these words – for the team and the League. “I get asked a lot about his. To me, it’s a position of service because I like to prac­tice servant leadership. It means I have the opportunity to serve. It means for me that I better do a good job because then others can use this as an opportu­nity to further demonstrate that women can excel in male-dominated industries. “I worked in one for 36 years. I just think it is further evidence that women can do the same jobs that men can do and we can excel like men can and at some point we need to get to there we are not talking about this at all and it’s no big deal and right now it is because you don’t see a lot of us. TMN: What drives you professional­ly and personally? MARSHALL: What drives me is a chance to serve. I actually truly believe I was put on this earth to serve. I have a unique skill set and whenever I get a call to do something big, I have to think this is an opportunity to serve people and a bigger cause. I’m very competitive in a good way. I am driven by competition. We (Mavs) want to set the NBA standard by 2019 for diversity and inclusion. One employ­ee thought ‘that’s impossible.’ And we did it. I want us to be the best: leading, motivating and inspiring people. I will do that, whether at home with family or out making a difference in the lives of other people on a daily basis. TMN: What is your biggest pet peeve? MARSHALL: I don’t like it when people don’t tell the truth. My husband would say, ‘yes, Cynthia, people lie.’ We can’t always deal with the truth. I can handle the truth. That is a big thing for me. Character is the first one. It is about telling the truth, doing what you say you will do, and if something happens, just tell the truth. Another pet peeve is when people have biases that negatively affect how they treat people, how they work, etc. All of this comes to work with you. When you are not open and don’t want to be open, not giving peo­ple a chance, etc. and oper­ating in a world that is not inclusive and diverse. TMN: What is your biggest accom­plishment? MARSHALL: Laying a good foun­dation for my children to thrive and flourish. All are adopted. They had edu­cational challenges, learning disabilities, weren’t, slated to be successful in school or even in life. I played a small part in laying a foundation educationally and spiritually,” Marshall says of her now 20, 23, 26 and 35-year-old children. In great candor, Marshall went on to disclose that she birthed five children, suffered four second-semester miscar­riages and had a daughter born four months premature who only lived six months. “The Lord treated me better than Job. I got quadruple for my trouble. I thought I had a plan and He said ‘no, I have the plan. You and Ken (her hus­band) will take care of them.’ All of them belong to us. TMN: What is your biggest failure? MARSHALL: “My biggest failure was also my biggest professional learning. I had a job, big promotion in the Pacific Bell days. I was so excited about this job, was going out to meet everyone, all the people, getting to know them etc. I used to say that my motto was: I do my peo­ple work by day my paperwork by night. I was a very hands-on servant leader. TMN: What is the biggest miscon­ception about you? MARSHALL: “People think that I am super tough all the time. The headlines might suggest I am just dealing with personnel issues, walking people out the door. What they don’t see is that I’ve lost nights of sleep. It’s just part of the job. I am just responding to people’s actions and everyone thinks I am just over here being a witch. TMN: What do you want people to know about Cynt Marshall? MARSHALL: “I wake up every morning to do the best I can do for people. I may not get it right every day. But I work hard to bring people togeth­er and be a light in this world and deal with the dark forces in the world. I feel uniquely equipped by God to bring pos­itive things to this world. This is all I am trying to do. “I accepted this job because a won­derful man – Mark Cuban – called me with sincerity, passion, genuinely and asked me to help address the issues in this place even though he didn’t know about them. “I said yes because I wanted to serve. I am fortunate I said yes. I have fallen in love with all the people who work here: the NBA, the owners, employees, etc., some of the best people. It was a whole industry I didn’t know about. I have fall­en in love. I’m just trying to make a dif­ference.